The Church, designed by Henry Hunter, has been the gateway to the village of South Hobart since 1859. It is even more so now since the Southern Outlet intersects with Macquarie Street a few metres from the church. Anyone who enters All Saints Church immediately becomes aware that there is something special here; not just because of the stunning glass crafted by William Clutterbuck and Ferguson and Urie; not just of the beautiful carved timber, lingering smell of incense or the votive candles burning at the Lady Shrine; but because of the prayers that have been offered by faithful worshippers over the years. But also because its architect, Henry Hunter was a student of the significant nineteenth century English Gothic Revival architect Augustus Welby Northmore Pugin. When Hunter found his way to Hobart he would have had contact with Bishop Robert WIllson, the first Roman Catholic Bishop of Hobart, who was also a friend of Pugin and shared his passion and belief. In a letter to The Tablet in 1848, Pugin wrote that “architecture is the barometer of faith”. 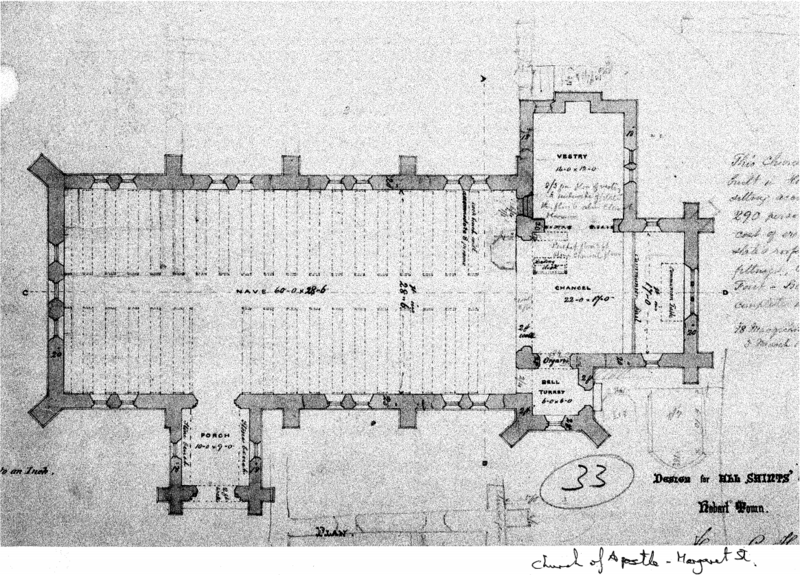 Both Willson and Pugin believed that to restore the architecture was to restore the faith with which it was associated. The spiritual journey of the parish of All Saints, South Hobart, its clergy and people, bears testimony to the truth of this belief. 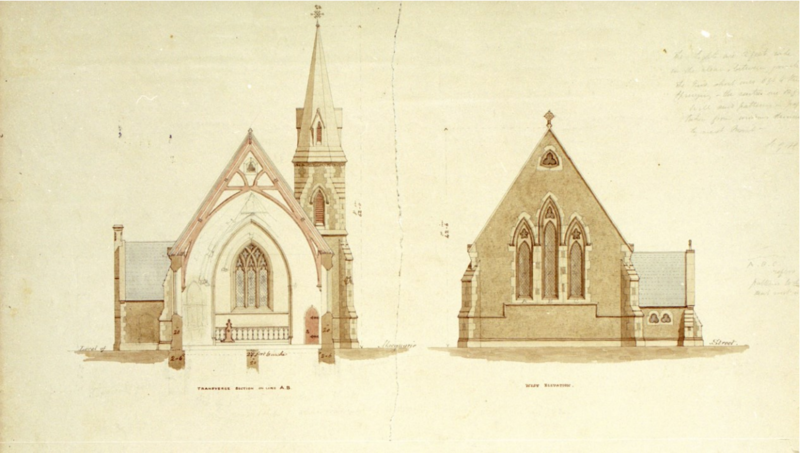 The Foundation Stone of the building was laid in 1859 and the church opened for worship in 1861. 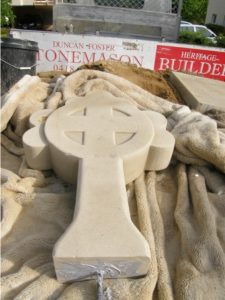 In 2009 the parish celebrated the church’s Sesqui-centenary of the laying of the foundation stone. This major event was the launching of an appeal to raise some $980,000 to restore the fabric of the building. To date the appeal has raised some $300,000, $80,000 of which is a grant from the Federal Government to be specifically applied to the restoration of the windows. The grant was obtained through the considerable efforts of Denison MP Andrew Wilkie. In the initial phase, attention was being given to the stonework on the west wall, which is the side that suffers the weather. This was completed in 2013. 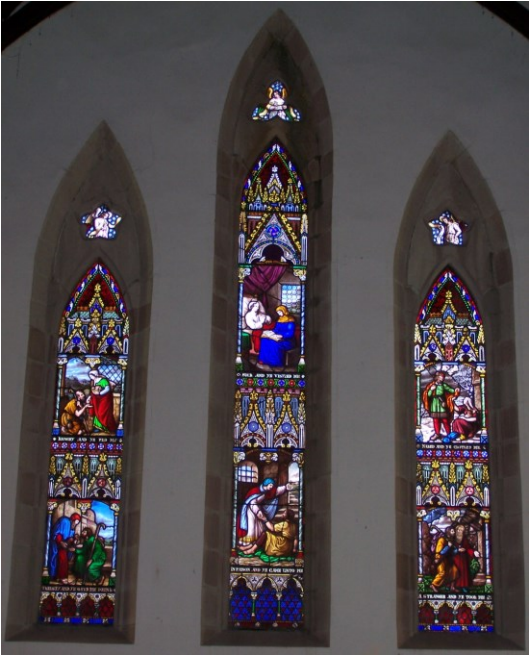 For more information, please visit our Stained Glass Window Restoration page. ABC television interview with Ray Brown, a great-great-great grandson of James Ferguson, Gavin Merrington (from ’Original Stained Glass’) our Stained Glass artist, and Duncan Foster, our stonemason. You can also listen to an audio recording of the interview from ABC Radio here. 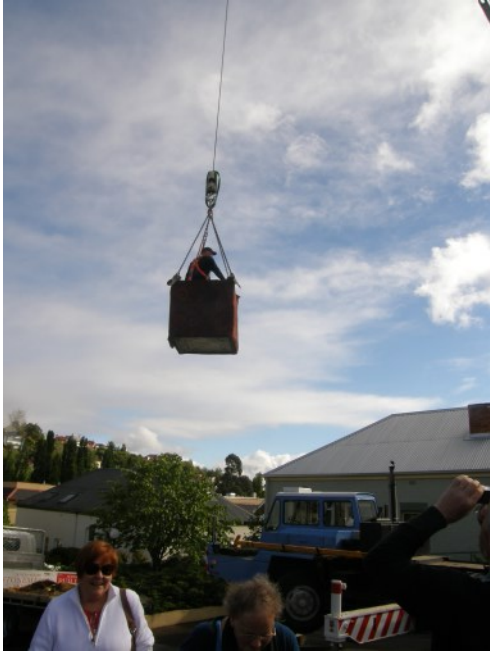 During Spring 2012 South Hobart was buffeted by strong gales. Unfortunately, it was discovered that the nave roof of the church (which was hitherto thought to be in sound condition) has been weakened by them significantly and moved. Much of the damage was very recent however, a proportion could be attributed to the roof not being tied down to the nave walls and lightness of construction. This is typical of roofs of the Victorian period which were designed to English standards and found to be not robust enough for the Tasmanian environment. The original Slate on the roof was much heavier and pushed the roof down. 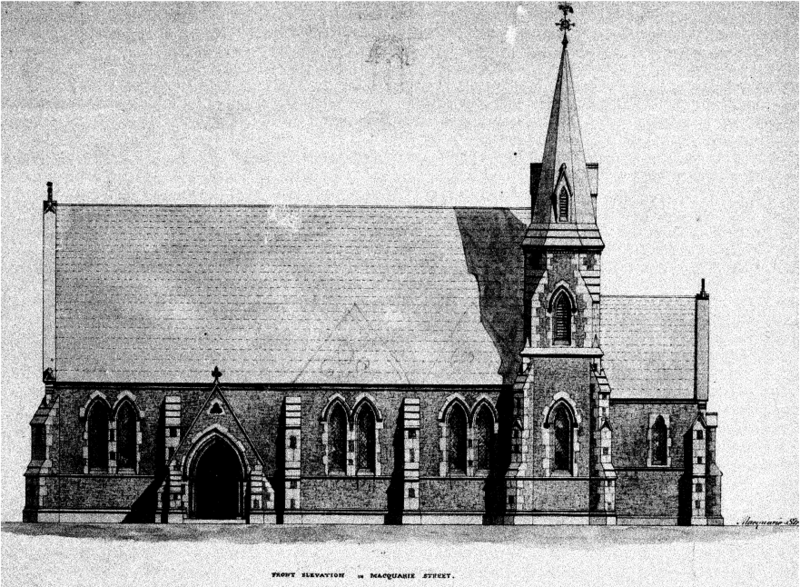 When that was replaced with much lighter corrugated iron the roof just lifted up and could no longer withstand the Tasmanian winds the church is subject to some extreme weather conditions which funnel along the Hobart rivulet valley and the west wall and nave roof have bear the brunt of the battering. A longitudinal strut steel beam has been fabricated and installed by crane to stiffen roof structure. The roof has been re-positioned correctly on the nave walls and the roof trusses and underpurlins repaired. 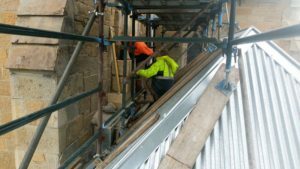 The roof rafters have been bolted to the underpurlins and the roof members affixed to the nave walls by steel plating and bolts. The Church owns it’s own scaffolding. These works were a serious worry and were quite unforeseen. The video below appeared on ABC news in Tasmania on 4 May 2013 and will give a little more insight into this project. 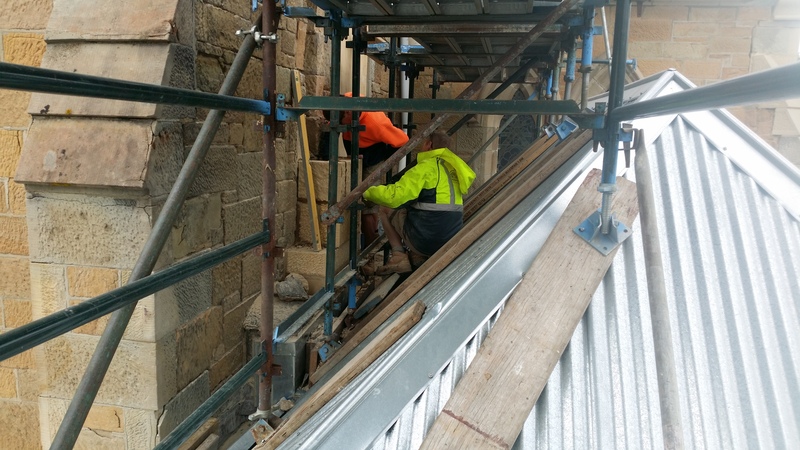 In 2013 the West Wall, which receives most of the winds rushing down the Hobart rivulet has been restored. Originally it was anticipated that 45 percent needed to be replaced. In reality the wall was in such bad shape that almost 70 percent of the stonework had to be replaced. 2015 saw the restoration of the lady chapel and sacristy. With new carpet and the ceiling repainted. We installed new lighting an re did the electricity in both places. In 2016 we realised that the chimney on the outside of Kennerley isle was in danger of falling so currently there is scaffolding up there and a brand new chimney is arising. And this will allow us to replace yet another cross on top of the church. 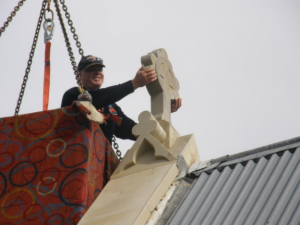 The cross at the top of the west wall of All Saints Church in South Hobart was blessed and replaced after an absence of 130 years. 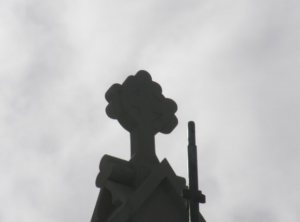 It was only when viewing photographs from the early decades of the Church’s history that it became clear that there had, in fact, been four crosses on the four points of the church. Three of the four crosses had, over the first few decades, disintegrated due to the effects of extreme weather from the west. The new cross, crafted by Tasmanian stonemason Duncan Foster, was carved from much stronger stone sourced from Buckland. Some slight modifications in the design will also help to strengthen it and ensure a much longer life. 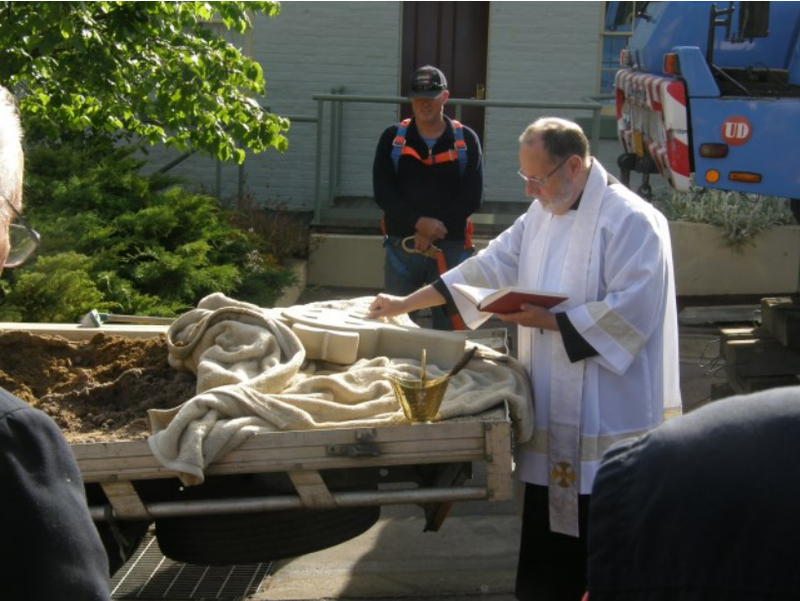 Parishioners and members of the South Hobart Progress Association who had provided funds to replace the crosses came to witness the blessing and raising of the cross. Reconstruction of the entire West Wall of the Main Church. 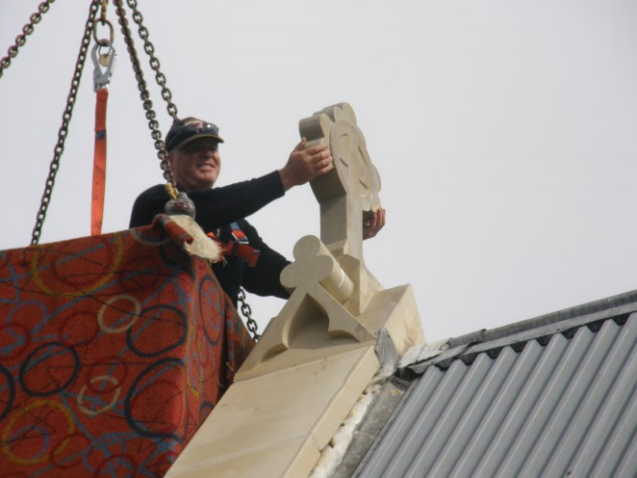 This includes the restoration and preservation of some of Australia’s most precious Stained Glass window art. The restoration and preservation of most of the other Stained Glass. A complete refurbishment of the Lady chapel. Including Lighting and electricity, restoration of the Mural, The Windows, the ceiling, the carpet and re plastering and re painting. The complete restoration of the porch. This includes the exterior stonework and the roof. Re doing the electricity and lighting Removal of Asbestos and damaging concrete. Re painting and plastering of the interior and a brand new floor. Currently undergoing the restoration of the Kennerley Isle West Wall with the whole chimney being replaced and the window arch and wall being restored. So far we have been able to put the Narthex West Wall Cross back up on the roof and the Cross above the porch. We are currently working on putting back the cross on the Kennerley Isle west wall and the East Wall above the sacristy. This last cross had to be take down last year by the Fire department as it was in danger of falling down during Gale force winds. All the other Solid Sandstone Roof Crosses (there wereat least 5, maybe 6) were removed or fell down during the 19th and early 20th centuries.